A Smokin Hot Co-Bill and Debut of new Music Projects from Star New Orleans and West Coast Funk Players. Hammond organist, pianist and singer Eamonn Flynn was born inDublin, Ireland. He first came to prominence as keyboardist on the 14 millionselling movie soundtrack The Commitments. Since moving to the U.S. he hasrecorded and toured with a long list of names including Michael Franti andSpearhead, Zigaboo Modeliste, Evelyn ‘Champagne’ King, Elvin Bishop, BernardPurdie, Grant Green Jr. Coco Montoya, Michelle Shocked, Pee Wee Ellis andDonald Harrison. Featuring an assortment of some of the finest musicians from theBay Area and New Orleans, the Eamonn Flynn Band play a unique blend of originalIrish soul and New Orleans/Bay area funk. The Brother Theodore Project is the brainchild of New Orleansnative, Ted "Blyss" Gould. A New Orleans native and veteranbass player, he has worked with Funk Music Legend Zigaboo Modeliste (theMeters), 80’s pop music and fashion icon, Jody Watley, Jon B., Prince Damons,Levi Seacer Jr. (Prince and the NPG), Ron E. Beck (Tower of Power), Nya Jadeand many more. 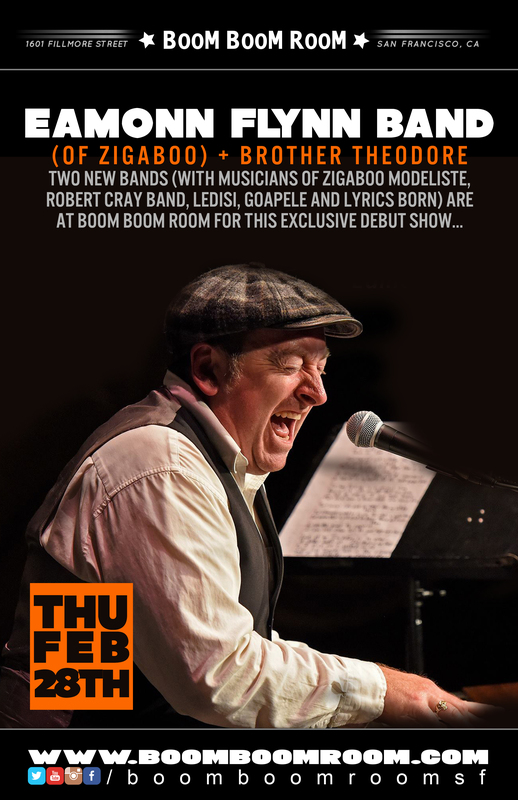 With the Brother Theodore project, Ted brings together themusical influences of New Orleans, Minneapolis, and Oakland, combining theminto his unique voice.